DIVINE Christian Gifts is part of one of the largest UK Christian Shops supplying one of the largest collections of Religious Gifts in the world. Serving the Christian Community since 2005! If you are preparing for that special occasion we have a good selection of gifts, as well as many Christian gift ideas for Advent, Christmas and Easter. Our huge range of quality Christian Gifts and Jewelry can be sent to any location, worldwide. We provide a quick delivery service within the UK and a very reliable international service to Australia, Canada, New Zealand, USA, South America, Asia, Europe and Africa. There are certain restrictions when sending to some locations, however, when shopping on our site, wherever you would like your order sending to, usually we will send it! Thank-you so very much for the quick shipping of my order with the beautiful free Christian Gift. I am so happy with all the goods. Thank-you all of you and God Bless. I wanted to confirm that I received my beautifully packaged order of Statues, these gifts are lovely and my family is so happy too. I also love the free Prayer Cards, thank-you. I will be always buy from you and can not wait to receive my next order from your Christian Shop. God bless you. Mrs B, British Columbia, Canada. Thank you! We have received our Religious Gifts and our family is really happy with them. We can not thank-you enough for the wonderful service and the quality of products that your Christian shop provides. We and our family will definitely be ordering more Religious Gifts from you in the future! Mr & Mrs R, Essex, UK. Thank-you for sending my order so quickly, everything was beautifully packaged. 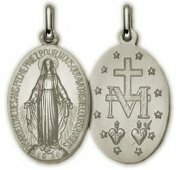 The Medal is lovely and something that I will cherish forever, I can not wait to order more wonderful gifts from your Christian Store. God bless you.